If you attend any type of networking event, seminars, workshops, tradeshows; listen to find out how you are wasting your time. There are six tips in this short episode on ways you can maximize the value from the events you attend, especially those you pay for. There is even a tip for those of you hosting events with sponsors - how to keep them coming back for more! Have more tips? Let me know. 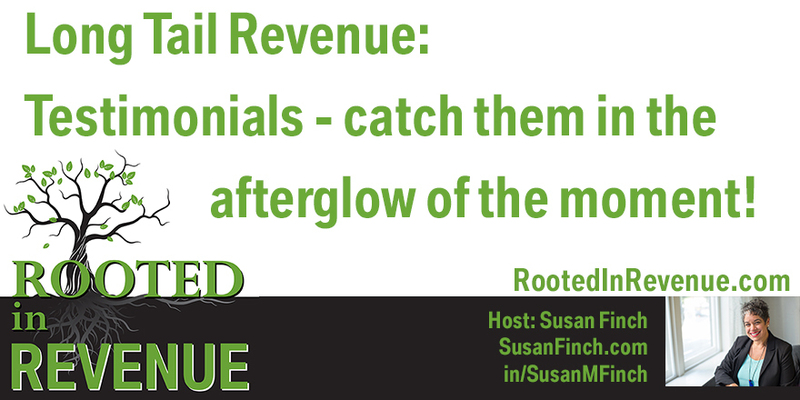 I'd love to hear how you generate revenue from attending events. I'm sure Lany would be interested, too. Testimonials - the glow of the moment: make the most of it. Get their permission respectfully. No one wants to feel used or like a poster child to build your client base. Tell them how YOU felt helping them complete the transaction. Get the permission in writing - tell them how you’ll use it. How about after you receive notification of a glowing recommendation on Google or LinkedIn or Facebook, Yelp and the like? Reach out to that client immediately, thank them and thank them publicly. At that point ask them if they’d be willing to give you an audio or video testimonial. Video is ALWAYS better because you can extract the audio for other purposes, to mix with a loop of recordings and more. In the case of a written compliment or testimonial, create a branded graphic with it so it looks special and send them that as a thank you with a link where it will appear.THis holds true for books - printed or digital. If they gave you a review that you are using in the book, SEND THEM A COMPLIMENTARY COPY with the graphic and tell them which page it appears on - even if it’s at the back, jacket cover or somewhere else. People appreciate being appreciated. After your event or workshop. Same ideas apply. An exit interview is perfect. AND if it’s not as complimentary as you’d like, it’s great feedback to address. Be brave and have your interviewer ask for the positives AND where you can improve. Follow up. You will continue to build your advocate network this way and generate longtail revenue.